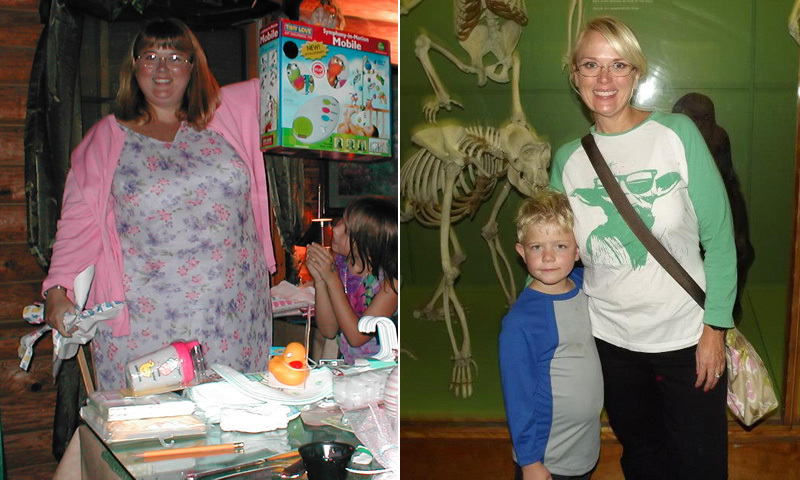 How I Gained It: I was addicted to fast and processed food. And I led a very sedentary lifestyle. Food filled a void for me. A void left by working parents, a lack of friends. I ate because I was bored. I ate because I was lonely. I ate because I could. I just ate. The bigger I got, the more I ate and the worse I would eat. I think a lot of the eating habits stemmed from growing up in the restaurant business, having food available all the time. I would feel good when I was eating, but as soon as I was done, I would feel horrible. So I just didn’t stop. I would eat a large bagel (or two) loaded with cream cheese for breakfast, a large take-out sub/fast food for lunch, then stop on the way home from school/work and get another fast-food meal and then stop at the gas station for a candy bar. Then go home for dinner, and then just eat for the rest of the night. Once I got home it was like an all-night buffet. I just didn’t stop eating: ice cream, chips, pizza. I always felt that people were judging me and talking about me when I would grocery shop, or be out with my kids and feeding them vegetables while I am munching away on a candy bar. Breaking Point: When I fell in the backyard and couldn't get up. My three young children had to run inside the house to get my husband. He had to roll me on a blanket and drag me inside. That was my "a-ha" moment. I knew I needed to change my lifestyle not only for myself, but for my entire family. How I Lost It: I enrolled in a gym. I started out very slowly. I began at the gym on the recumbent bicycle, but I longed to get into the group fitness room. I could see the room from my bike and I just couldn’t wait to get in there, but I was so worried what other people might think about me. Finally after about three months I decided I didn’t care anymore what other people thought. This journey was for me and my family, not for other people. In January 2009, I took my first Les Mills group fitness class: Body Step. I was very nervous, and I was too big and too out of shape to use the step, so I just did the moves on the floor. I also spoke to my instructor, told her of my goals and my limitations and together we came up with a signal that I could give her so she could show me an easier option. After three months, I started using the step. I was feeling more confident in myself and in my body. I had people in my class noticing that I was losing weight, and I started to make some friends in the group fitness class. I also started adding BODYPUMP to my routine right around this three-month mark. Soon after I was able to do two hours of consecutive exercise; cardio and strength. And I loved it! I loved the person I was becoming. The athlete in me started to emerge. So I started trying other Les Mills classes, like BODYCOMBAT and RPM. My body started to change shape; I was becoming leaner, fitter, a better person on the outside and the inside. Group fitness has forever changed my life. Now, nearly four years later, I am a BODYPUMP and RPM addict! I also love the core training program CXWORX. CXWORX has made me a more efficient runner and overall athlete. And I have made great friends with my group fitness buddies! We cheer each other on and motivate each other. I also totally changed my diet and started paying close attention to what I was putting in my body. I gave up all processed and fast food -- all of it! Now, I try to be somewhat creative with my meals, but I never learned how to cook when I was younger, so this is all new to me! I have several cookbooks and my husband gives me lessons, too. He is a very good cook and makes wonderfully healthy meals. I'll have an egg-white omelete with spinach, mushrooms, bell peppers and tomatoes for breakfast with a slice of Ezekial bread. Lunch is generally my largest meal of the day, lean protein like fish, chicken or shrimp on a bed of greens, or a salad with a lot of beans. For dinner, I usually have whole wheat pasta, brown rice, quinoa or couscous with lean protein. And during the day I snack on all sorts of fruit. Apples, bananas and mangoes are my favorite. At night, I occasionally have some air-popped popcorn or a frozen yogurt bar. My life is completely different. I run marathons, triathlons, and participate in endurance challenges and mud runs. And more importantly, I can play with my kids. We go on family bike rides and run 5Ks together. It's a great life, and I enjoy every moment of it.